These DIY chocolate chip jar cookies are perfect for a Christmas gift! Easy to make and easy to assemble, you’re friends, family, colleagues and neighbours will love to make these for the holiday season! Make for Christmas, or make all year round with different ribbons and gift tags! Who doesn’t love the gift of food? OMG. I LOVE DIY Christmas gifts! Seriously, there is something so cool about making your own Chrissy gifts for friends, family and other loved ones! 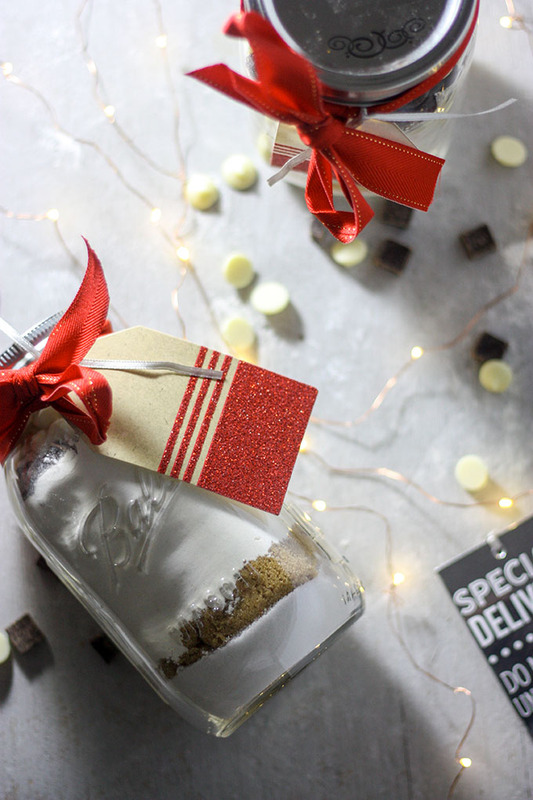 Whether it’s brownie jars, cookie jars, chocolate bark, rum balls, DIY food gifts are such a versatile, easy, and affordable gift to give. These DIY chocolate chip jar cookies are no exception. The recipe for these cookie jars is my Mum’s tried and tested recipe that she has been making for many, many years! I remember making these with Mum back in Australia when I was a kid and they were always my absolute fav! Plus they’re crazy easy to make and assemble. You’ll simply layer the ingredients carefully in a jar, add the seal, ties a bow, add instructions for cooking and give the best gift ever! How easy is that? The cooking process is ridiculously easy too. Beat butter, add eggs, add everything else. Dollop dough onto a tray. Bake. The finished product? Soft and fluffy chocolate chip cookies that taste SO good, you won’t be able to stop at one! These will take you about 5 minutes to assemble, and there is really nothing to it. They’re perfect for the foodie in your life, and people that love to cook! I found for assembly, it’s slow and steady wins the race. Don’t get over excited and throw all the ingredients in at once like I did the first time I made these. Take a leeetle time layering the dry ingredients, to make an insta worthy pic! In the recipe card below. I included ingredients and instructions to make AND bake the cookies. 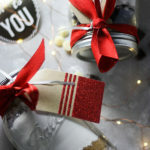 The make, is what you put into the mason jar (dry ingredients), the bake, are the instructions you need to write down on a little tag, so the person receiving the gift knows how to make the cookies! Important step, don’t forget! 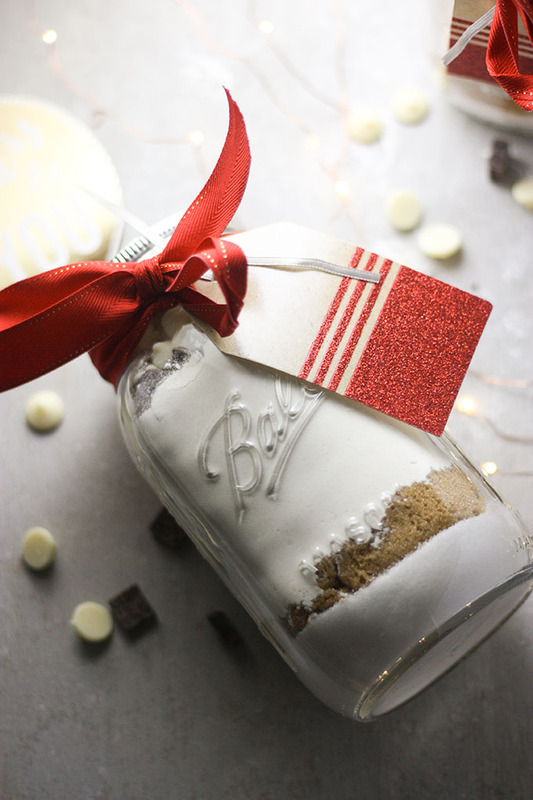 So here’s to a Merry Christmas and here’s to giving an amazing DIY chocolate chip cookie jar as a gift! You can’t go wrong with a food gift! These DIY chocolate chip jar cookies are the perfect gift to give this Christmas! An easy to make cookie jar, filled with delicious ingredients to make simple, yet delish cookies! A great gift for the foodie in your life! Layer ingredients in a large mason jar. Beat butter in a bowl until light and fluffy. Add contents of jar and beat together 5 minutes with hand mixer until well combined. Use a tablespoon to scoop 1 tablespoon of mixture onto a baking tray lined with parchment paper. Bake 15-18 minutes, or until lightly browned on the edges. Join the discussion! Do you like baking for the holiday season? What do you bake? 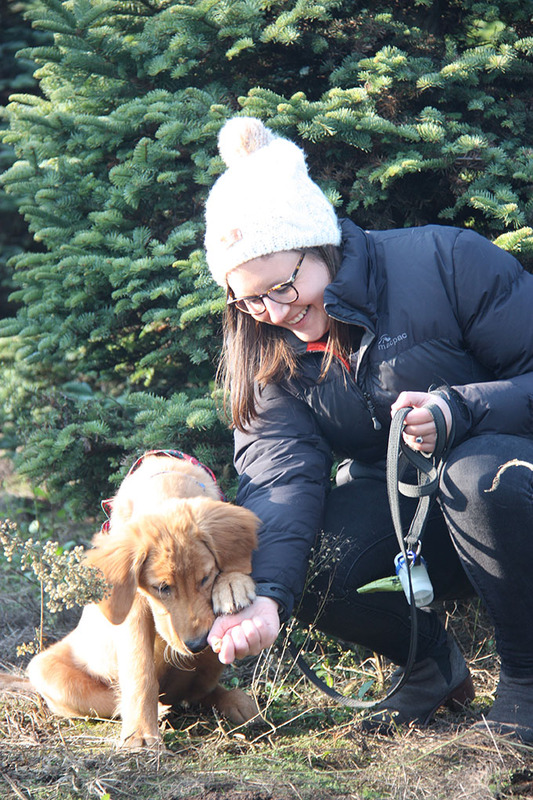 We took him to the Christmas tree farm to get our first tree in Portland! He wasn’t really winning to pose though! Wow, great minds do think alike even if I say so myself:) These look so cute and I bet no one would complain if they got cookie mix in a jar as a gift:) Merry (almost) Christmas! Christmas DIY gifts are the best! And who wouldn’t want to get cookies in a jar? LOVE IT! I’m glad you gave us directions to be slow and steady. I’m not terribly good at that – haha. These are such a cute gift idea!! ha the first one i made was a disaster! so many uneven layers! that would be a great gift for someone new to baking! these are literally so easy to make!